The Knitting Friends, who meet regularly in the Heaton Moor Park Pavilion, have just sent their latest parcel of knitted squares to the Freedom From Fistula Foundation.The Knitting Friends have been supporting this charity for around four years and have sent several parcels of squares off in that time. The 6 inch squares are easy to knit when you’re busy chatting and make use of odd bits of yarn that are left over from larger projects. The current parcel, weighing around 1 kg, contains 76 squares representing a rainbow of colours. It’s great to think that one day soon a woman in Africa will knit or sew these together into a blanket during her post-surgery rehabilitation and will take it home with her to celebrate her recovery. 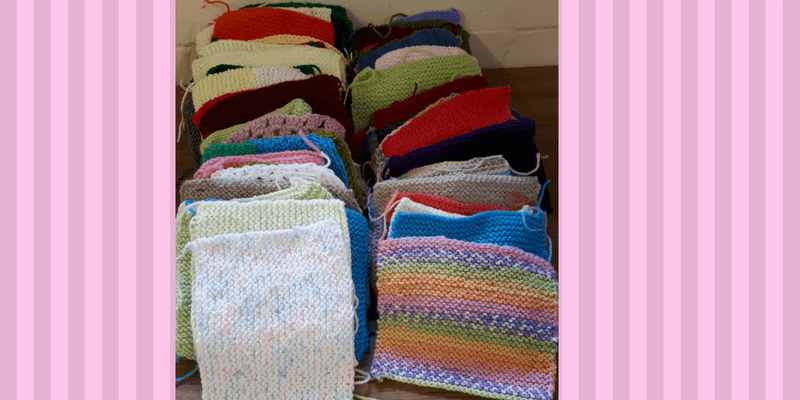 If you knit, and would like to to contribute to the next parcel, just make 6 inch knitted or crocheted squares, any pattern, any colour. Note: you’ll probably need 32 stitches on 4mm needles if using double knitting yarn; garter stitch is fine but it’s an opportunity to try out new patterns/stitches. Simply give any squares to any of the Friends of Heaton Moor Park, or use the contact form on this website to arrange collection or drop off. And of course, you are most welcome to bring them along on a Friday morning (10-12) to the Park Pavilion and meet up with the Knitting Friends!